Infinite Workstation Gold, Multi-Instrument Sample Bank from Sonic Reality. Sonic Reality has announced the release of a virtual instrument plug-in/Kontakt-based sample library bundle called "Infinite Workstation Gold", featuring a selection of multi-sampled instruments ranging from pianos, vintage keyboards, guitars and bass to a complete orchestra, vocal pads and world instruments. With 3,000 sounds and around 12 gigabytes of sample content Infinite Workstation Gold is designed with the songwriter/composer or producer in mind. Sonic Reality has created many of the "workstation" sounds heard in software and hardware products such as IK Multimedia's Sonik Synth, SampleTron,SampleMoog, SampleTank and Miroslav Philharmonik, Propellerheads' Reason and SR's Sonic Refills, Steinberg's Cubase andHALion One, Native Instruments' Bandstandand Kontakt, Yamaha's Motif, Roland's JV andS Series, Clavia's Wave, Alesis's QS Series and others. Now a variety of "fully expanded" workstation sounds are available together as a bundle in NI's Kontakt format. While it's a sample library for Kontakt and Komplete users, it also works as its own virtual instrument plug-in for ProTools, Cubase, Logic and other DAWS, as well as a stand-alone software for Mac and PC. This is because it comes with Sonic Reality's "Infinite Player" license that allows the encrypted sounds of this collection to work inside NI's FREE "Kontakt Player" which is also included in the bundle. Sonic Reality has taken its "Sonik Capsule" series and over the years has expanded the original 5 titles to 15 "Kapsules" for Kontakt format. 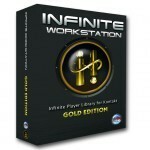 The Infinite Workstation Gold is a bundle of all 15 Kapsule titles plus additional content such as "OmniSoundz" GM set, 300 meg grand piano and bonus sounds from other "Kontakt/Infinite Player Family" sound collections by Sonic Reality. Orchestral Brass Kapsule: 984MB/128 Sounds. Orchestral Strings Kapsule: 1.75 GB/219 Sounds. Orchestral Percussion Kapsule: 790 MB/102 Sounds. Orchestral Woodwinds Kapsule: 1.19 GB/165 Sounds. Orchestral Ensembles Kapsule: 677MB/40 Sounds. World Instrument Kapsule: 454MB/82 Sounds. Acoustic Guitar Kapsule: 476MB/72 Sounds. Electric Guitar Kapsule: 453MB/72 Sounds. Electronic Drums Kapsule: 403MB/464 Sounds. Studio Drums Kapsule: 510MB/723 Sounds. Omnisoundz 2 GM Collection: 1.06GB/133 Sounds. Deluxe Grand Piano C7: 300MB. Infinite Foundation Collection which features sounds from Sonic Reality's Drum Masters Series, Cinema Sessions, Serafine FX Tron and more. 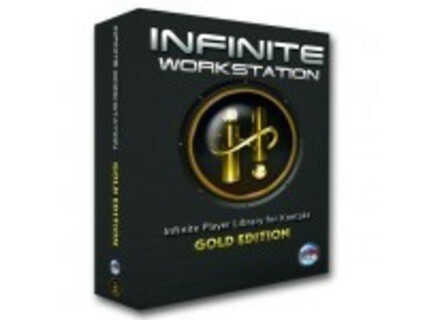 All together, the Infinite Workstation Gold offers a savings of over 65% off as a bundle all 15 titles plus additional sounds. With an original value of over $1,200, the price of the Infinite Workstation Gold package is $299 (Estimated Street Price). $399. MSRP ($299 Estimated Street Price). Infinite Workstation Gold will be available from Sonic Reality's e-commerce outlet www.esoundz.com as well as from all Sonic Reality dealers and distributors in Q1, 2011. TC Electronic Halts Powercore, Announces UAD-2 Crossgrade TC Electronic and Universal Audio announce a collaboration to offer a crossgrade option to UAD-2 for registered PowerCore users, as further development for the PowerCore range comes to a halt. Loomer Updates Resound & Manifold Loomer has announced that Manifold v1.5.0 and Resound v1.5.0 for Mac OS X, Windows, and Linux are now available. VescoFx Free Queue vescoFx has released an updated version of the Free Queue equalizer plug-in, including Mac OS X compatibility.